Roll Call’s Janie Lorber reports on mystery tea baggers TheTeaParty.net, an Arizona based Tea Party group that apparently raises money, promotes itself, and nothing else. A little-known, Arizona-based tea party organization has hired a prominent Republican operative to help advance its mission in Washington, D.C. But after more than a year in operation and hundreds of thousands of dollars in donations, it’s still not clear what the group’s mission actually is. 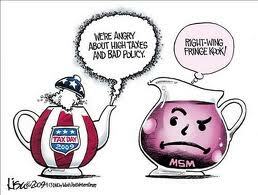 […] Despite its extensive website and an impressive ability to pull in money, TheTeaParty.net appears to do little more than promote its own name. It appears that the organization also makes money off its mailing list. Emails obtained by Roll Call reveal that the group has rented its 200,000-person mailing list to companies such as Gold Rarities Gallery, an online gold and silver warehouse. An advertising representative at Newsmax said he helps TheTeaParty.net find clients and confirmed that the list is available for $7,000 ($35 for every thousand names). Dooling said no personal information is released to third parties during the process. It seems all this group does is attempt to perpetuate itself and send out emails demonizing Unions in Wisconsin. It seems tea baggers are tired of Washington wasting their money so they’re sending it to mysterious groups with no accountability instead.